We had such a great turn out last year, and everyone was amazing during the January 2014 Wintereenmas that we decided to throw another summer event! And now.. what you’ve all been waiting for… Summer Gamers Association Expo 2014! Doors Open – Friday, July 18th, 2014 @ 2:00pm. Shut down at 2:00am, Saturday Morning. Saturday, July 19th, 2014 – Door re-open at 9:00am. Shut down at 2:00am, Sunday morning. Sunday, July 20th, 2014 – Doors re-open at 9:00am. Clean up starts at 3:30pm. NOTE: Please note the date has changed. We had some booking troubles with the Hall and were forced to make the event 2 WEEKS EARLIER! The location is air conditioned, and is in the basement. We should have no troubles with too much heat! Click here for an Event FAQ! Computer or console games not your thing? Pay for a weekend pass and come for card, board games or miniature gaming! Bring your pen and paper RPG group (no LARPing please) in for a epic weekend marathon! Please note: Gambling for money is not allowed. Any betting games must use chips and have no monetary gains or losses attached. All attendees are required to sign a waiver before they begin setting up their stations. 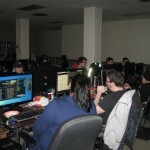 If you will be PC or Console gaming you need to reserve a LAN spot for $25.00. This guarantees you a spot at a table with a LAN connection. If you are going to be tabletop gaming then $10.00 will get you a weekend pass that allows you access for the weekend. We are still accepting a few registrations at the door for LAN spots, and the Weekend tabletop gaming pass is also available at the door. We’ve had people bring their own and just fire up a game. I’m not sure what some of them were called, but we did have an epic Cards Against Humanity game going in January! Please note: We had to change the date of the event. The new dates are now: July 18, 19, and 20th!